Conductive paint and glues are ideal to make conductive paths to ground for SEM samples. Used for making contacts, conductive bonding of samples on specimen stubs or shielding surfaces of non-conducting samples. The EM-Tec conductive paint and cements are used for many applications besides electron microscopy in repairing contacts, tracks on circuit boards, prototyping, conductive lubrication, electrochemical plating and EMI/RFI shielding. The EM-Tec C30 premium water based conductive carbon paint is solvent free and should be preferred to avoid hydro-carbon contamination in the SEM. EM-Tec C30 is a premium, water based conductive carbon paint with fine dispersed graphite flakes (~3μm). The EM-Tec C30 carbon paint does not contain any hydro-carbon based solvents and is fully compatible with high vacuum (HV) systems and even UHV systems when dry. Due to its low viscosity, cracks and small gaps are easily filled. EM-Tec C30 shows good conductivity when dry. 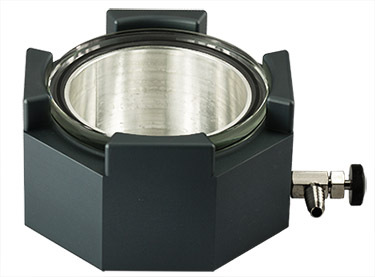 Ideal for mounting SEM specimens and making grounding paths. Samples can be easily removed afterwards due to its low mechanical strength. Good bonding properties on a wide variety of sample materials such as metals, rocks, concrete, ceramics, epoxies, wood and textiles. Other applications are lubrication on moving surfaces and shielding. EM-Tec C30 contains approx. 20% graphite in the solution. On hydrophobic materials, we advise to use the solvent based carbon paints #15-001133 or 15-001139. Supplied in a 60cc glass bottle with 40g contents and a cap with brush. Keep container above 0 degrees Celcius; do not freeze! EM-Tec C30 is a premium, water based conductive carbon paint with fine dispersed graphite flakes (~3μm). The EM-Tec C30 carbon paint does not contain any hydro-carbon based solvents and is fully compatible with high vacuum (HV) systems and even UHV systems when dry. Due to its low viscosity, cracks and small gaps are easily filled. EM-Tec C30 shows good conductivity when dry. Ideal for mounting SEM specimens and making grounding paths. Samples can be easily removed afterwards due to its low mechanical strength. Good bonding properties on a wide variety of sample materials such as metals, rocks, concrete, ceramics, epoxies, wood and textiles. Other applications are lubrication on moving surfaces and shielding. EM-Tec C30 contains approx. 20% graphite in the solution. On hydrophobic materials, we advise to use the solvent based carbon paints #15-001133 or 15-001139. Supplied in a 100cc PET bottle with 100g contents. Keep container above 0 degrees Celcius; do not freeze! EM-Tec C33 is an extremely fast drying thin carbon paint (similar to aerosol sprays). EM-Tec C33 has been developed to cover large areas quickly with a thin conductive layer. Ideal for making grounding paths and for covering parts of non-conductive epoxy mounts. Due to its low viscosity it easily fills cracks and narrow gaps. EM-Tec C33 is one of the fastest drying carbon paint on the market. Samples can be removed relatively easily due to its low bonding strength. EM-Tec C33 dries very quickly; less suitable for flexible surfaces. Solvent is isopropanol, solution contains approximately 10% graphite with a polymer based binder. Moderate conductivity. Supplied in a 30cc glass bottle with 15g contents and a separate brush. EM-Tec C38 is a strong conductive carbon cement based on fine carbon black and graphite flakes with an acrylic binder. EM-Tec C38 exhibits excellent bonding properties on a large variety of materials such as metals, plastics, ceramics, epoxies, rubber, glass, wood and textiles. Ideally suited for making grounding paths and to bond SEM samples on sample stubs. The tough acrylic binder reduces material loss; can be used to make permanent bonds. It has the consistency of a thin paste. Dries relatively quickly, depending on thickness; drying goes quicker with moderate heat up to 65°C. Can be used on flexible surfaces. Solvent is acetone, solution contains approximately 15% carbon black and graphite, acrylic based binder. EM-Tec C38 shows enhanced conductivity when dry. Supplied in a 30cc glass bottle with 25g contents and separate brush. EM-Tec AG15 is a conductive silver paint based on very fine silver flakes with a thermoplastic resin binder with MEK / acetone as diluent. EM-Tec AG15 is fully comparable to EDAG 1415M and DAG 915 from Acheson / Henkel. Applications are making grounding paths and conductive glue for SEM samples, electronic and shielding applications. Achieves good bonding properties on a wide variety of materials including, plastics, ceramics, glass, metals, wood, rubber, epoxies and textiles. The low viscosity silver paint is ideal for making grounding tracks and to bond SEM samples on sample stubs. Samples can be easily removed. This silver cement has the consistency of a paint. Dries relatively quickly, depending on thickness; reduce drying time with moderate heat up to 70°C. Solution contains 57.5 – 59 % silver. EM-Tec AG15 exhibits excellent conductivity. Supplied in a 15cc glass bottle with a brush, 15 gram. EM-Tec AG15 is a conductive silver paint based on very fine silver flakes with a thermoplastic resin binder with MEK / acetone as diluent. EM-Tec AG15 is fully comparable to EDAG 1415M and DAG 915 from Acheson / Henkel. Applications are making grounding paths and conductive glue for SEM samples, electronic and shielding applications. Achieves good bonding properties on a wide variety of materials including, plastics, ceramics, glass, metals, wood, rubber, epoxies and textiles. 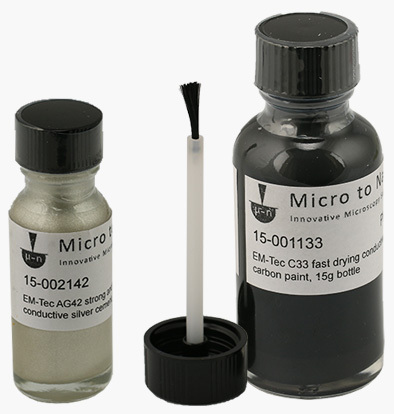 The low viscosity silver paint is ideal for making grounding tracks and to bond SEM samples on sample stubs. Samples can be easily removed. This silver cement has the consistency of a paint. Dries relatively quickly, depending on thickness; reduce drying time with moderate heat up to 70°C. Solution contains 57.5 – 59 % silver. EM-Tec AG15 exhibits excellent conductivity. Supplied in a 30cc glass bottle with a brush, 25 gram. EM-Tec STC 15 MEK extender, thinner and cleaner for the EM-Tec AG15 conductive silver paint. 99.9% pure Methyl Ethyl Ketone. Supplied in a 30cc glass bottle. EM-Tec AG42 is a strong conductive silver cement based on fine silver flakes (10-1μm) with an acrylic binder. Achieves excellent bonding properties on a wide variety of materials including, plastics, ceramics, glass, metals, wood, rubber, epoxies and textiles. The strong and tough acrylic binder reduces material loss where as the silver flakes ensure excellent conductivity. Use when highest conductivity is needed. Ideal for making grounding tracks and to bond SEM samples on sample stubs. This silver cement has the consistency of a paste. Dries relatively quickly, depending on thickness; drying time can be reduced with moderate heat up to 65°C. Can be used on flexible surfaces. Solvent is acetone, solution contains approximately 73% silver, acrylic based binder. Excellent conductivity. Supplied in a 15cc glass bottle with a brush, 15 gram. EM-Tec AG42 is a strong conductive silver cement based on fine silver flakes (10-1μm) with an acrylic binder. Achieves excellent bonding properties on a wide variety of materials including, plastics, ceramics, glass, metals, wood, rubber, epoxies and textiles. The strong and tough acrylic binder reduces material loss where as the silver flakes ensure excellent conductivity. Use when highest conductivity is needed. Ideal for making grounding tracks and to bond SEM samples on sample stubs. This silver cement has the consistency of a paste. Dries relatively quickly, depending on thickness; drying time can be reduced with moderate heat up to 65°C. Can be used on flexible surfaces. Solvent is acetone, solution contains approximately 73% silver, acrylic based binder. EM-Tec AG42 shows excellent conductivity. Supplied in a 15cc glass bottle with a brush, 25 gram. EM-Tec AG44 is a conductive silver paint based on fine silver flakes (10-1um size) with a low VOC acrylic binder. Achieves excellent bonding properties on a wide variety of materials including, plastics, ceramics, glass, metals, wood, rubber, epoxies and textiles. The tough, low VOC acrylic binder reduces material loss whereas the silver flakes ensure excellent conductivity. Use when highest conductivity is needed. Ideal for making grounding tracks and to bond SEM samples on sample stubs. Samples can be easily removed. This silver cement has the consistency of a thin paste. Dries relatively quickly, depending on thickness; reduce drying time with moderate heat up to 65°C. Can be used on flexible surfaces. Solvent is acetone, solution contains 61% silver, acrylic based binder. EM-Tec AG44 exhibits excellent conductivity. Supplied in a 15cc glass bottle with a brush, 15 gram. EM-Tec AG44 is a strong conductive silver paint based on fine silver flakes (10-1um size) with a low VOC acrylic binder. Achieves excellent bonding properties on a wide variety of materials including, plastics, ceramics, glass, metals, wood, rubber, epoxies and textiles. The tough, low VOC, acrylic binder reduces material loss whereas the silver flakes (10-1um) ensure excellent conductivity. Use when highest conductivity is needed. Ideal for making grounding tracks and to bond SEM samples on sample stubs. Samples can be easily removed. This silver cement has the consistency of a thin paste. Dries relatively quickly, depending on thickness; reduce drying time with moderate heat up to 65°C. Can be used on flexible surfaces. Solvent is acetone, solution contains 61% silver, acrylic based binder. EM-Tec AG42 shows excellent conductivity. Supplied in a 30cc glass bottle with a brush, 25 gram. EM-Tec AG46 is a conductive silver paint based on fine silver flakes (10-1um size) with a water based urethane binder. It does not contain VOC, is solvent-free and is non-flammable. Achieves excellent bonding properties on a wide variety of materials including, plastics, ceramics, glass, metals, wood, paper and paints. Safe to use on even the most delicate plastics. The water-based urethane binder reduces material loss whereas the silver flakes ensure excellent conductivity. Ideal for making grounding tracks and to bond SEM samples on sample stubs. Samples can be easily removed. This silver cement has the consistency of a paint. Dries relatively quickly, depending on thickness; reduce drying time with moderate heat up to 65°C. Solvent is water, solution contains 60% silver, urethane based binder. EM-Tec AG46 exhibits excellent conductivity. Supplied in a 15cc glass bottle with a brush, 15 gram. Keep container above 0 degrees Celcius; do not freeze! EM-Tec AG46 is a conductive silver paint based on fine silver flakes (10-1um size) with a water based urethane binder. It does not contain VOC, is solvent-free and is non-flammable. Achieves excellent bonding properties on a wide variety of materials including, plastics, ceramics, glass, metals, wood, paper and paints. Safe to use on even the most delicate plastics. The water-based urethane binder reduces material loss whereas the silver flakes ensure excellent conductivity. Ideal for making grounding tracks and to bond SEM samples on sample stubs. Samples can be easily removed. This silver cement has the consistency of a paint. Dries relatively quickly, depending on thickness; reduce drying time with moderate heat up to 65°C. Solvent is water, solution contains 60% silver, urethane based binder. EM-Tec AG46 exhibits excellent conductivity. Supplied in a 30cc glass bottle with a brush, 25 gram. Keep container above 0 degrees Celcius; do not freeze! The EM-Tec AC29 is a conductive paint with silver coated copper flakes. It is an acrylic based thin paint with good bonding properties, good conductivity and affordable pricing. Conductivity is comparable to silver paints. Ideal for making grounding paths and coating non-conductive surfaces; it can be used for permanent bonding of SEM samples to sample stubs. It has the consistency of a thin paint. EM-Tec AC29 dries relatively quickly, depending on thickness; drying goes quicker with moderate heat up to 65°C. Solvent is acetone, solution contains approximately 31% silver coated copper flakes, acrylic based binder. EM-Tec AC29 exhibits very good conductivity when dry. Supplied in a 30cc glass bottle with 25g contents and separate brush. The EM-Tec NI41 conductive glue with nickel is an excellent alternative when silver or carbon cement are not required. It is a strong acrylic based glue with excellent bonding properties, good conductivity and affordable pricing. Same tough acrylic binder used for the carbon and silver cement. Conductivity is between silver and carbon conductive cements. Can be used for permanent bonding of SEM samples to sample stubs. It has the consistency of a paste. Dries relatively quickly, depending on thickness; drying goes quicker with moderate heat up to 65°C. Can be used on flexible surfaces. Solvent is acetone, solution contains approximately 50% nickel, acrylic based binder. EM-Tec NI41 shows very good conductivity when dry. Supplied in a 30cc glass bottle with 25g contents and separate brush.